This time of year, with so much to do, I tend to do lots of nothing, or bits of lots. Basically, I have trouble focusing on the task at hand. Yes, I should be wrapping gifts, yes, I should do a little baking, yes, I should run an errand or seven. 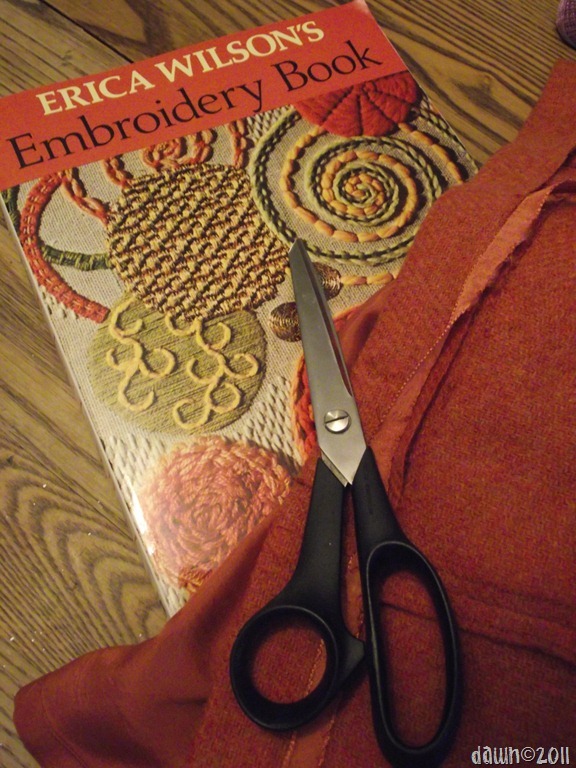 Instead, I am cutting the hemming tape off of a thrifted wool skirt and reading my new “Erica Wilson Embroidery” book that arrived in the mail today. The skirt is a crab. It’s the perfect color and once felted it will have a nice weight to it. I’m going to make a large Dungeness crab and a small blue crab that my boys saw in Hawaii (they called him a ninja crab because he was very fast and sneaky). This coming year my focus will be on the fabrics that go into my work. I’m going to be dyeing my own, thrifting more and of course, embellishing them with stitching, beads (and possibly sequins) more. I’m excited.